Root-end filling materials should possess certain properties such as it should own good sealing ability, improve the seal of existing root canal filling material, and should be biocompatible with the periradicular tissues. Low solubility frolicked an essential role on the success rate of the surgical procedure. As per ISO 6876 standard, the suitable limit of weight loss for solubility test is 3%. The root-end filling material should also have the ability to increase the pH and release of calcium ions (Ca++) as it leads to mineralized tissue formation. Among the available root-end filling materials, mineral trioxide aggregate (MTA) has become more popular, as it has low solubility and good sealing ability. In 1993, at Loma Linda University, Dr. Torabinejad invented MTA. MTA is a complex blend of hydrophilic tricalcium silicate, tricalcium oxide, and tricalcium aluminate with added oxides (bismuth oxide). However, it has revealed specific drawbacks of extended setting time and challenging handling properties. So as to recover some MTA drawbacks, numerous new calcium silicate-based materials have been invented., Biodentine is one of these materials. Biodentine is a calcium silicate-based material introduced in 2010 by Giillies and Olivier. Constituents of biodentine are tricalcium silicate powder packed in capsules (7.0 g), calcium carbonate (filler material) to be mixed with a liquid phase (0.18 mL) comprising calcium chloride (decreases the setting time), and a hydrosoluble polymer (water-reducing agent) (Biodentine Scientific File 2010). Sixty ring molds of stainless steel having inner diameter of 20 mm ± 0.1 mm and a height of 1.5 mm ± 0.1 mm were manufactured. With acetone, the molds were washed for 15 min in an ultrasound bath and then were dehydrated in air for 30 min. Mixing of MTA and biodentine was done according to manufacturer's directions. The molds were positioned on a glass slab and mixing of materials was done, ultimately molds were filled to excess with the mixed test materials corresponding to two groups (n = 30). Then, with a Mylar strip, the molds were roofed, and thereafter, the glass plate was sited on top of the molds to eliminate any extra material and then the molds were placed inside an incubator cabinet at 37°C. After 24 h, molds were removed from the incubator, and the exposure of molds to air for 15 min was done. Each mold was assessed with balance, three times to record the average reading and this weight was noted as initial dry weight (IDW) of the samples. Sixty amber-colored glass bottles were labeled and dried. The mass of these labeled and dried bottles was noted as dry bottle weight. Five milliliters of deionized water was poured into these bottles and the molds were shifted into them. The bottles were kept in an incubator at 37°C for 24 h. After 24 h, bottles were eliminated from the incubator, and with the help of a syringe, washing of each mold in bottles with 15 mL of distilled water was done. Extra residual water in the bottles was vaporized in an oven by keeping a temperature slightly below boiling point and then the bottles were dried in the oven at 105°C and cooled down in the same oven. The mass of separate bottle was noted individually as final dry weight (FDW). Solubility of each tester was determined by the following formula and was expressed as a percentage value of IDW. (It has to be kept in mind that, with regard to the strict definition of the physicochemical term solubility, the test used in the present study measured the elution of water-soluble material but not the solubility. Hence, IDW was subtracted from the obtained results to measure the amount of material evaporated from bottles.). After recording the FDW at 24 h, deionized water was to the bottles. Then, these bottles were transferred to the incubator for further evaluation at intervals of 3, 10, 30, and 60 days using the same method. Data were analyzed with independent t-test. Thirty specimens of each test material to be studied were prepared. The test materials were mixed according to manufacturer's instructions. Sixty 1 cm long polyethylene tubes were filled with MTA and biodentine. Instantly, after organizing the materials and filling, the tubes were placed in lidded flasks containing 10 mL distilled water and were kept in an oven at 37°C. After 2 h, the flasks were removed from hot air oven, and the water was assessed for pH and calcium ion release. pH readings were performed with an pH Meter. Calcium release was monitored with an atomic absorption spectrophotometer. The tubes containing the cements were placed in new flasks with 10 mL of deionized water for further analysis in the different time intervals of 6 h, 24 h and 7, 28 days, respectively. Data were analyzed with independent t-test. Statistical analysis was performed with the help of independent t-test. The results of solubility test with a statistical comparison of mean and standard deviation between the groups at different time intervals are listed in [Table 1]. Statistical difference was noted between the solubility values of biodentine and MTA among each of the five time intervals. 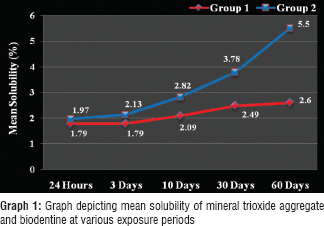 [Graph 1] depicts mean solubility of MTA and biodentine at various exposure periods. The solubility of MTA at different time intervals was 1.79% at 24 h, 1.79% at 3 days, 2.09% at 10 days, 2.49% at 30 days, and 2.60% at 60 days. From the data obtained from the present study, MTA showed an increase in solubility. From the data obtained from the present study, MTA showed increase in solubility. No statistical difference was noted between the solubility of biodentine in comparison with MTA up to 10-day exposure times. Biodentine showed acceptable solubility values at exposure times of 24 h (1.97%), 3 days (2.13%), and 10 days (2.82%). Thereafter, it demonstrated a marked increase in solubility (day 10 [2.82%] vs. day 30 [3.78%]) and day 30 (3.78%) versus day 60 (5.50%). The results of pH test with statistical comparison of mean and standard deviation between the groups at different time intervals are listed in [Table 2]. 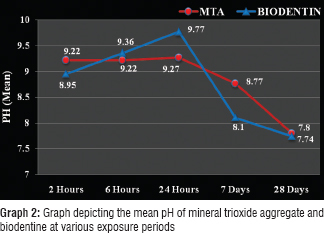 [Graph 2] depicts mean pH of MTA and biodentine at various exposure periods. Both biodentine and MTA presented alkaline pH value in the initial periods (2 h) 8.95 and 9.22, respectively. After 6 h, the pH value of biodentine increases (9.36), and for MTA, it remains same (9.22). After 7 days, the pH values for biodentine and MTA were 8.10 and 8.77, respectively. After 28 days, biodentine and MTA (7.80) showed further decrease in pH values and both biodentine and MTA presented almost similar neutral pH (7.74) and 7.80, respectively. Both biodentine and MTA presented statistically significant difference up to 7 days, after 28 days both were statistically nonsignificant. The results of calcium ion release test with statistical comparison of mean and standard deviation between the groups at different time intervals are listed in [Table 3]. 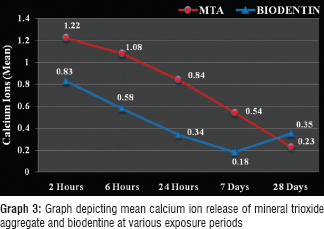 [Graph 3] depicts mean calcium ion release of MTA and biodentine at various exposure periods. Both biodentine and MTA presented high Ca++ release values in the initial periods (2 h) (0.83 mg/dl and 1.22 mg/dl), respectively. Among both the groups, MTA showed high Ca++ release initially throughout the study. After 6 h, the Ca++ release values of biodentine decrease (0.58 mg/dl), and for MTA, it remains same (1.08 mg/dl). After 24 h, there was decline in Ca++ release values for both biodentine (0.34 mg/dl) and MTA (0.84 mg/dl). After 7 days, Ca++ release values for biodentine and MTA further decreased and biodentine showed least Ca++ release at this stage throughout the study and values were 0.18 mg/dl and 0.54 mg/dl, respectively. MTA showed greater values for calcium ion release at 2 h, 6 h, 24 h, and 7 days. After 28 days, Ca++ release values for biodentine increased to 0.35 mg/dl as compared to MTA which was 0.23 mg/dl. The results for both biodentine and MTA were statistically significant throughout the study. The present study tested MTA and biodentine comparing their solubility, pH, and calcium ion release. As root-end filling materials are usually in contact with periradicular tissue fluid, so it is important to find solubility of test groups for longer periods, as some materials might be stable immediately after setting but may undergo disintegration with time. Solubility of a root-end filling materials is an essential property as it may influence other properties such as sealing ability, biocompatibility, and mutual effects with adjacent environment. The ability of a material to seal and get solubilized may influence treatment prognosis. To avoid venomous effects on surrounding tissues by root-end filling materials, these have very low solubility. International Standard ISO 6876 (2001) the process to evaluate the solubility of set root canal sealer in water was described, so same method was applied for the present study. According to ISO, the dissolved amount should be <3% of the whole mass. The solubility tests done in the present study followed the procedure of International Standard for root canal sealer because ProRoot MTA and biodentine can be used as root-end filling constituents which directly communicate with the periradicular tissues such as sealers. Solubility of a solid is the condition where a pure chemical compound is in thermodynamic equilibrium with its solution. The amount of the solubility of a substance in a solvent is evaluated as the saturation concentration, after which adding more solute does not increase its concentration in the solution. The particles of the material may fall out from the cement structure during storage in the liquid. Furthermore, water uptake may compensate for dissolved material. There was a marked difference between the solubility of ProRoot MTA and biodentine. It was found that ProRoot MTA was significantly less soluble than biodentine; still biodentine and MTA showed comparable solubility values for evaluation periods of up to 10 days. Significantly, biodentine was more soluble than MTA for 30 and 60 days immersion periods. It can be hypothesized that, to exert a biologic effect, to some extent, it must solubilize to release Ca++. Under the situations of this in vitro study, ProRoot MTA can be designated as nearly unsolvable 30 days. The bismuth oxide added in ProRoot MTA is virtually insoluble in water. The greater solubility of biodentine could be explained due to possibly higher dissolution of ions than MTA. Calcium and silicon uptake was compared by Han et al., with elemental mapping and line scan study of root canal dentin in contrast with ProRoot MTA and biodentine in the existence of phosphate-buffered saline and showed broader calcium- and silicon-rich dentin areas and more merging depths with biodentine samples than MTA. They credited their conclusions to greater amounts of calcium and silicon dissolution in biodentine than in MTA. Biodentine expresses biomimetic remineralization and leads to accumulation of calcium phosphate on the surface, with the fast formation of apatite and making biodentine a platform for clinical healing. Cell attachment and cell proliferation on biodentine are comparable to MTA. Biodentine causes accumulation of amorphous calcium phosphate coating with radicular dentin and that calcium phosphate ratio of this layer is equivalent to MTA. Healthy apical tissues are formed endorsely by MTA than other materials as it shows a low incidence of inflammation. Polyethylene tubes containing test specimen were immersed in deionized water having neutral pH and devoid of any ions. Polyethylene tubes instead of extracted teeth were used for the study as it is difficult to standardize the foramen opening. The specimens were submerged in deionized water, and pH was recorded at 2 h, 24 h, 7 days, and 28 days, respectively. To standardize the test conditions, calcium release and pH were measured in distilled water. A pH meter was used to measure the pH of the specimens. After 2 h, the specimens were transferred to the next set of flask containing deionized water, while the first set of flask containing ionized water was used for the evaluation of pH and calcium ion. The same method was repeated for study groups after 6 and 24 h, 7 and 28 days. The procedure used for this study has the advantage of permitting pH measurements at periods longer than the setting time, which not only represents the pH of the material but also its ability of alkalinization. The high pH of MTA at its best at 2 h can be defended by the existence of calcium oxide in the composition, which reacts with water and dissociates into hydroxyl and Ca++, responsible for the increased alkalinity and creating a sterile environment. The calcium found in the solution should be in its hydroxide state at this high pH level. This capability to release calcium hydroxide could be of clinical significance because MTA has capacity to induce mineralization. O-2 ions from the silicate tetrahedral links are source of hydroxyl ions and the dissolution of CaO, while the secondary sources include the sodium and potassium alkalis are at low concentrations. Calcium oxide in the material composition reacts with the tissue fluids and produces calcium hydroxide, which in turn dissociates into hydroxide and Ca++. The hydroxide ions are liable for alkalinization and lead to activation of alkaline phosphatase. Extracellular presence of calcium ion induces bone morphogenetic protein-2 (BMP-2) expression and reacts with the carbonate ions present in the periapical tissue, which causes precipitation of calcite granules to activate the deposition of mineralized tissue. The overall pH of the materials was initially lower compared with the period of 2 h. This might be related to the initial high contents of hydroxyls formed. In contrast, after 24 h of water immersion, the overall pH of the materials was lower compared to the initial values. When the calcium hydroxide reacts with carbon dioxide from the surrounding water or atmospheric air neutralizes calcium hydroxide and might explain this finding. Biodentine could explain the prolonged alkaline pH observed in the current study by the presence of calcium silicate particles in biodentine, like all calcium silicate materials, react with water to form a high pH solution containing Ca2+, OH, and silicate ions. Precipitation of calcium silicate hydrates' gel and nucleation calcium hydroxide occurs on the cement particles. Polymerization of calcium silicate hydrate gel occurs to form a solid network; also calcium hydroxide is released to increase the alkalinity of the adjoining medium. High alkalinity has the ability to induce dentinal collagen denaturation; this assists the penetration of Ca++ and exchange of mineral forming the “mineral infiltration zone” at the dentin and biodentine interface. The capability to release calcium ion is an important factor for successful endodontic treatment and pulp capping procedures because calcium acts on mineralizing cell thus help in cell differentiation, hard tissue mineralization, and regulates osteopontin and BMP-2 levels. The eluted Ca++ increase the propagation of human dental pulp cells, and calcium release boosts the activity of pyrophosphatase, which aids to sustain dentin mineralization and the development of a dentin bridge. At all study intervals, both biodentine and MTA showed statistically significant difference. MTA released significantly higher Ca++ compared to biodentine throughout the experiment but increases and becomes higher after 28 days. Nevertheless, Ca++ release from both materials dropped with time. Between MTA and biodentine higher values were seen for MTA up to 7 days. This can be explained due to the fact that MTA has a greater quantity of calcium-containing combinations as compared to biodentine. Although the calcium ion release of biodentine was low initially till 28 days, it increases to more than that of MTA after 28 days. The initial low calcium ion release of biodentine can be explained by the fast hydration reaction of biodentine which leads to its fast setting, hence low solubility and low calcium ion release. After 28 days, the calcium ion release values for biodentine increases and becomes higher which can be correlated with the presence of calcium chloride in biodentine liquid; in contrast, liquid of MTA is deionized water, which may also lead to the existing results. The higher calcium release by biodentine after 28 days indicates the ability of biodentine to release biologically relevant ions potentially acting as epigenetic chemical signals for the initiation of mineralizing bone or dentin-forming cells. This statement can be supported by recent studies that demonstrate the inductive effects of biodentine on gene expression by pulp cells and odontoblasts. Due to its flattering biological properties, calcium carbonate could have advantageous effects on mineralizing cell activation., MTA rapidly releases Ca++ and creates an alkaline pH on the external surface, leading to the nucleation and crystallization of B-type hydroxycarbonate apatite on the cement surface. The Ca/P ratio formed from the apatite layer increases over soaking time which indicates the maturation of a carbonated-apatite phase (bone-like apatite), where carbonate replaces phosphate ions. From the data obtained from the present study, MTA and biodentine both showed an increase in solubility. Solubility of biodentine in comparison with MTA at 24 h exposure times showed no statistical difference (P = 0.061). Afterward, a marked increase in solubility was shown. 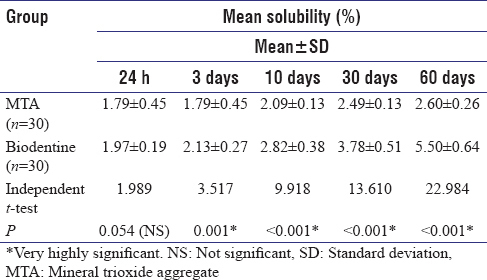 Solubility of biodentine in comparison with MTA at 3, 10, 30, and 60 days exposure times showed very high solubility which is statistically significant (P < 0.001). High solubility of biodentine may be working in favor of the material than against it because solubility leads to increase ion release which causes biomimetic remineralization and deposition of interfacial layer with the root dentin and it was concluded that biodentine demonstrated higher solubility in contrast with MTA. 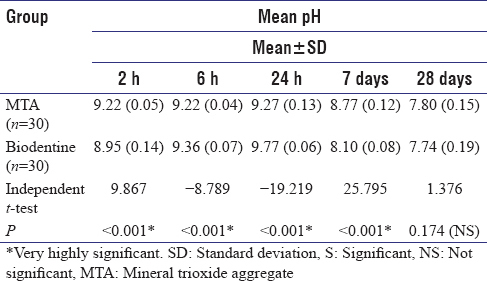 Both biodentine and MTA presented alkaline pH value in the initial periods (2 h). At 6 h, the pH value of biodentine increases, and for MTA, it remains same. At 24 h, biodentine presented highest pH value and MTA showed slight increase in pH values. After 7 days, pH values for both biodentine and MTA decreased, and at 28 days, both biodentine and MTA presented almost similar neutral pH. 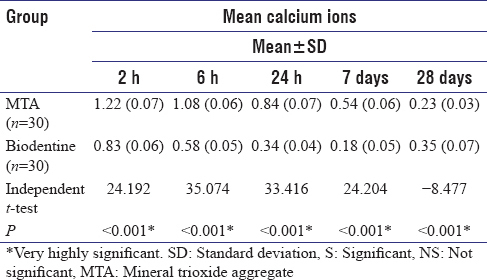 MTA showed greater values for calcium ion release at 2 h, 6 h, 24 h, and 7 days. After 28 days, Ca++ release values for biodentine increased to as compared to MTA. Ceci M, Beltrami R, Chiesa M, Colombo M, Poggio C. Biological and chemical-physical properties of root-end filling materials: A comparative study. J Conserv Dent 2015;18:94-9. Vasudev SK, Goel BR, Tyagi S. Root end filling materials – A review. Endodontology 2003;15:12-8.
International Organization for Standardization. Specification for Dental Root Canal Sealing Materials: ISO 6876. Geneva: International Organization for Standardization; 2001. Filho MT, Saçaki JN, Tanomaru JMG. PH and calcium ion release evaluation of pure and calcium hydroxide-containing epiphany for use in retrograde filling. J Appl Oral Sci 2011;19:1-5. Singh S, Podar R, Dadu S, Kulkarni G, Purba R. Solubility of a new calcium silicate-based root-end filling material. J Conserv Dent 2015;18:149-53. Aqrabawi J. Sealing ability of amalgam, super EBA cement, and MTA when used as retrograde filling materials. Br Dent J 2000;188:266-8. Dammaschke T, Gerth HU, Züchner H, Schäfer E. Chemical and physical surface and bulk material characterization of white ProRoot MTA and two Portland cements. Dent Mater 2005;21:731-8. Duarte MAH, Demarchi ACCO, Yamashita JC, Kuga MC, Fraga SC. pH and calcium ion release of 2 root filling materials. Oral Surg Oral Med Oral Pathol Oral Radiol Endod 2003;95:345-7. Giillies R, Olivier M. Dental Composition. Patent WO2011/124841, US2013/0025498. Saint-Maur-des-Fosses, France: Applicant Septodent; 2011. Gandolfi MG, Siboni F, Polimeni A, Bossu M, Riccitiello F, Rengo S, et al.In vitro screening of the apatite-forming ability, biointeractivity and physical and chemical properties of a tricalcium silicate material for endodontics and restorative dentistry. Dent J 2013;1:41-60. Samiei M, Shahi S, Aslaminabadi N, Valizadeh H, Aghazadeh Z, Pakdel SM, et al. Anew simulated plasma for assessing the solubility of mineral trioxide aggregate. Iran Endod J 2015;10:30-4. Danesh G, Dammaschke T, Gerth HU, Zandbiglari T, Schäfer E. A comparative study of selected properties of ProRoot mineral trioxide aggregate and two Portland cements. Int Endod J 2006;39:213-9. Torabinejad M. Mineral Trioxide Aggregate. Properties and Clinical Applications Book. New Jersey: John Wiley & Sons, Inc; 2014. Jain SV, Kothamachu S, Chandak MG, Nikhade P. An in vitro comparison four root-end filling material's solubility. Int J Dent Clin 2013;5:1-3. Duarte MAH, Demarchi ACCO, Yamashita JC, Kuga MC, Fraga SC. pH and calcium ion release of 2 root filling materials. Oral Surg Oral Med Oral Pathol Oral Radiol Endod 2003:95:345-7. Khan SIR, Ramachandran A, Deepalakshmi M, Kumar KS. Evaluation of pH and calcium ion release of mineral trioxide aggregate and a new root-end filling material. E J Dent 2012;2:166-9. Estrela C, Bammann LL, Estrela CR, Silva RS, Pécora JD. Antimicrobial and chemical study of MTA, Portland cement, calcium hydroxide paste, Sealapex and Dycal. Braz Dent J 2000;11:3-9. Rashid F, Shiba H, Mizuno N, Mouri Y, Fujita T, Shinohara H, et al. The effect of extracellular calcium ion on gene expression of bone-related proteins in human pulp cells. J Endod 2003;29:104-7. Da Silva JW, Souza PHC, Rosa EAR, Cury AADB, Rached RN. Mineral trioxide aggregate as root canal filing material: comparative study of physical properties. Rev Odonto Ciênc 2010;25:386-390. Koubi S, Elmerini H, Koubi G, Tassery H, Camps J. Quantitative evaluation by glucose diffusion of microleakage in aged calcium silicate-based open-sandwich restorations. Int J Dent 2012;2012:105863. Gandolfi MG, Siboni F, Botero T. Calcium silicate and calcium hydroxide materials for pulp capping: Biointeractivity, porosity, solubility and bioactivity of current formulations. J Appl Biomater Funct Mater 2015;131:43-60. Combes C, Miao B, Bareille R, Rey C. Preparation, physical-chemical characterisation and cytocompatibility of calcium carbonate cements. Biomaterials 2006;27:1945-54. Dey A, de With G, Sommerdijk NA. In situ techniques in biomimetic mineralization studies of calcium carbonate. Chem Soc Rev 2010;39:397-409.